My music listening habits have taken on the shape of a tuning fork. On one tine is electronic music of all sorts, from artists and producers like Ooah, Samples, FS, and others. On the other tine is rap and hip-hop with social and protest themes. I’ve written about Maxilla Blue and Soul Khan before, and I still play Immortal Technique’s Martyr album on a regular basis. 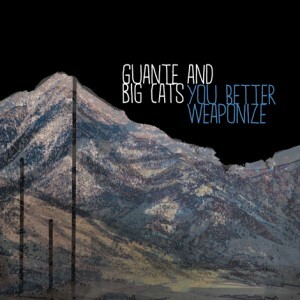 Today I’m going to write a little bit about “You Better Weaponize,” an album my Minnesota-area artists Guante and Big Cats. I like it so much I’m going to buy a copy for one of you. Although Guante has put out several albums before, You Better Weaponize is a big leap forward. I’ve listened to his prior albums (“Don’t Be Nice” and “An Unwelcome Guest”), and while these albums are good there’s something about the tracks on Weaponize that really got me in the heart. Guante’s style is unique. At times it’s a little more spoken word than rap. This technique is helpful when I want to focus on the message and less on the music. Guante makes reference to slowing down his speed on a track, and that’s a common hook from other rappers in the activist sub-genre. I’ve heard it from Soul Khan, Maxilla Blue, KRS-One, and others. In fact, I might make it an attribute to classify someone as an activist rapper. It seems odd to call out speaking clearly and slowly as a distinguishing technique, but it’s true. I’ve listened to rap for over 25 years, so my “rap ear” is pretty well tuned but part of my reason for writing is to introduce folks to music they normally don’t listen to. In this regard, listening to Guante is easy on the ear so you can really concentrate on what he’s trying to say. The material for You Better Weaponize ranges from talking about the value of physical contact to censorship to being connected to your community to calls for social revolution. The album is a great introduction for this kind of rap, and every track will make you think. My favorite song on the album is Lightning, which talks about overcoming adversity. If the first stanza doesn’t make you want to pay attention you need to shut the stereo off and go back to sleeping in your coffin. I think it’s normal to listen to this kind of music and not agree with 100% of what’s being said. Part of the reason I like listening to political / activist music is sometimes it pushes my current belief system. I bumped up hard against this wall with “The Invisible Backpacker of Privilege,” which discusses the advantages white rappers have in the hip-hop industry. The advantages white rappers have in the hip-hop industry? If you can name enough popular white rappers to make a fist you are a scholar of rap music. One thing I do know is that I don’t know everything, and maybe Guante’s right. So track #11 is my boundary track on this album. I think part of my disconnect with it is it flashes me back to Virginia, and being told I could never understand African-American literature because I wasn’t black. I’m willing to accept my own historical bias and I usually place Backpacker first when I listen to the album to make sure I give it another listen. On the other hand, “Other” seems custom written for me. The point of the song is that people of multi-racial descent can’t be categorized by the components of their gene pool. “Other” also suggests that there are more people who are mixed than those who are “pure blooded.” I don’t know if that is true or not, but I wish it was. If you know me, I pass very easily as a white person. People are usually surprised to learn of my mixed heritage. Every critter with a heart beat in this house is mixed, and I believe that “hybrid vigor” applies to one’s outlook on life as well as one’s physiology. Guante’s You Better Weaponize is so good that I’m giving away a digital copy of the album. If you can’t wait (and I wouldn’t blame you) you can buy it for at least $10 on Bandcamp.com or on Amazon.com if you are already part of that ecosystem. Leave a comment about an album you’re listening to a lot right now. Make sure that you use your real email address when leaving a comment — that’s how I’ll notify you that you’ve won. 4 Comments on "Music You Need to Own: You Better Weaponize by Guante and Big Cats"
The Days to Come EP. I’ve been listening to zircon’s Identity Sequence album. Officially released yesterday, but I had an advance copy due to backing on Kickstarter. It’s awesome. Cyberpunk-inspired electronica with awesome vocals by his wife, Jillian, and other friends of his. I’d recommend listening to Arms Open Wide, Million Years, Identity Sequence and Colossus if you don’t want to listen to the whole album. Hey– just happened to come across this post today and wanted to say thanks so much for listening, and in particular listening with a critical ear, something that seems to be increasingly rare these days. I’m glad you like the album. As for the Invisible Backpacker track, I think it’s helpful to think about it less as a song saying that “all white rappers everywhere have it easy” than as a specific example or entry point to the idea of how privilege functions more broadly. Of course, white rappers in specific contexts face adversity; but they also have advantages in other contexts, and I think those advantages are generally less explicit or talked-about, which is why we wanted to make the song. And I’m not sure where you’re writing from, but I should also mention that the track maybe has added relevance here in the midwest where the hip hop scene is so diverse, and possibly loses some of its punch in other regions. Anyways, it’s a song we’re proud of, though I’m really glad people are having critical conversations about it. I may very well be off the mark. Hi DrFaulken, I’m going to give a mini-review of an album I’m listening to continuously right now, back-to-back with ‘You Better Weaponize’. The album is Sole’s ‘A Ruthless Criticism of Everything Existing’ and you need it in your life.